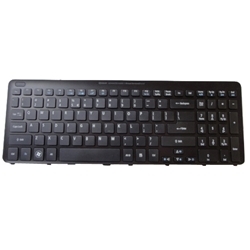 Description: New original Acer Aspire ultrabook replacement keyboard with black frame. This genuine notebook keyboard includes the ribbon cable. Part #'s: 60.M2DN1.033, 60.M2FN1.027, MP-11F53U4-4424, 6M.4VMKB.009, 904VM07O1D, NKI171300. Acer Aspire V5-531, V5-531G, V5-531P, V5-531PG, V5-571, V5-571G, V5-571P, V5-571PG.